When it comes to Christmas I will forever remain a 5 yr old. I get ever so excited. About decorations, the food, the parties, being with family, giving presents. Interestingly, the excitement is not so evident at my own presents... I became the proud yet tied owner of a mortgage on December 11 1998: 3 weeks before Christmas and my 21st birthday. The frivolity of my parental presents ended in an instant when (as with many of us) want becomes need and things like a new iron or home phone became the priority. 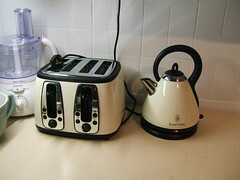 This year its a kettle and a toaster. Already in place - mum wants me to make sure they both work.